The Capital One® VentureOne® Rewards Credit Card is ideal for travelers who go to any destination, whether it’s domestic or abroad since the foreign transaction fee is none. With a $0 annual fee, this card is a good way to earn miles on all spending. It’s particularly beneficial for those who spend less than $8,000 a year. Spending more than $8,000 and you’d be better off with the Capital One® Venture® Rewards Credit Card. (661) Over the Past 60 Days! 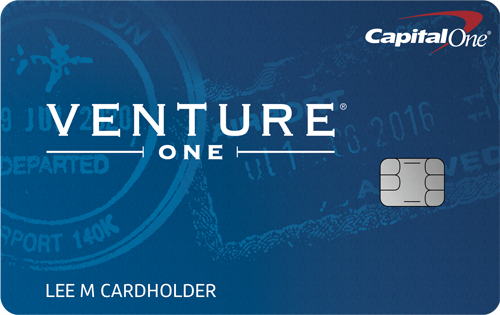 The Capital One® VentureOne® Rewards Credit Card provides several benefits that may come in handy when traveling. You can have an added layer of protection with lost luggage reimbursement, special offers, a dedicated concierge service available 24/7, among other perks (explained more later). This is a great way to make traveling less stressful and take advantage of exclusive offers. This card has a lower rewards rate than other travel reward cards at 1.25 Miles per dollar on every purchase, every day. You can find travel reward cards that not only carry no annual fee, but have a higher flat-rate rewards program such as the Discover it® Miles with Unlimited 1.5x Miles per dollar on all purchases, every day. Be aware that other cards have different benefits, so you need to consider all factors before choosing a card. To earn the most miles, use this card for all spending. Another way to increase your miles is to utilize the one-time bonus of 20,000 miles once you spend $1,000 on purchases within 3 months of account opening, equal to $200 in travel. This will give your miles an extra boost, as long as you meet the requirements. Since the foreign transaction fee is none, be sure to use this card wherever you travel abroad. The Capital One® VentureOne® Rewards Credit Card offers 1.25 Miles per dollar on every purchase, every day. You can redeem miles as a statement credit for travel purchases via Purchase Eraser®, for new travel purchases made with the Rewards Center, for a check, account credit, gift card and more. Travel purchases eligible for Purchase Eraser® include: airlines, hotels, rail lines, car rental agencies, limousine services, bus lines, cruise lines, taxi cabs, travel agents and timeshares. Note that these redemptions must be made within 90 days from the date your travel purchase posts to your account. In addition, there is a one-time bonus of 20,000 miles once you spend $1,000 on purchases within 3 months of account opening, equal to $200 in travel. There are two comparable cards from Capital One for people who want to earn miles: the Capital One® VentureOne® Rewards Credit Card and the Capital One® Venture® Rewards Credit Card. Both of these cards offer Visa Signature® benefits, as wells as rewards programs where you can earn miles. But a closer look shows two key differences in annual fee and rewards rate. The Capital One® VentureOne® Rewards Credit Card has a $0 annual fee, great for those who don’t want to pay for the card. Meanwhile, the Capital One® Venture® Rewards Credit Card has an annual fee of $0 intro for first year; $95 after that. Although the $0 annual fee Capital One® VentureOne® Rewards Credit Card is a good card, people who spend over $8,000 a year will see more benefit with the Capital One® Venture® Rewards Credit Card. That’s because once you hit $8,000 a year, you begin earning more net miles compared to the Capital One® VentureOne® Rewards Credit Card (this calculation considers the annual fee effective after year one). The Capital One® VentureOne® Rewards Credit Card is a good option for travelers who spend less than $8,000 a year and want a $0 annual fee card. You earn a decent rewards rate on top of great Visa Signature® benefits.